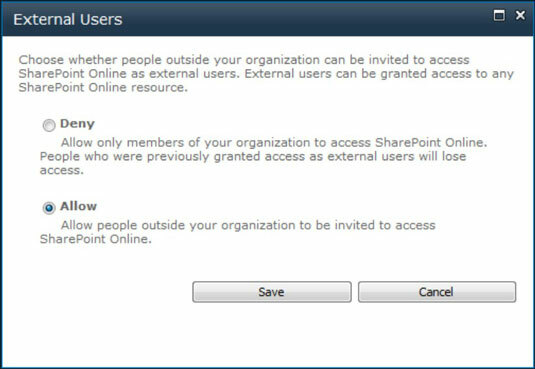 SharePoint Online, one of the products bundled with Office 365, provides a unified infrastructure for organizations to share documents not only with colleagues, but also with external partners. A site collection owner can enable external sharing and then invite external users to collaborate on sites, lists, and libraries. To address security issues, the infrastructure is designed so that external users will only have access to sites to which they are invited. And the best part? Every Office 365 customer will get 50 external partner access licenses (PAL) free! Additional PAL licenses can be purchased at a minimal cost. On the Microsoft Online Services Portal, click Manage below SharePoint Online. From the Administration Center, click Manage Site Collections. On the SharePoint Online Administration Center dashboard, click Site Settings below the Site Collections toolbar. On your team site, click Site Actions and then select Share this site from the drop-down menu. Enter the e-mail addresses of the external users you want to invite either as a visitor or a member. Any valid e-mail address can be used for the invitation. The external user, however, needs either a Hotmail or Windows Live account to log in. Enter your message and then click Send. When the external user successfully logs in, an Office 365 account is then created and this account becomes their sign-in name and password credentials.